The newest addition to my office set-up is this organising pannier, the first of a pair to be attached to the side of my desk chair as well as my garden work chair. Although my desk was reasonably tidy with much of the supplies stored in the desk organiser and nearby drawers, shelves and hooks, I preferred to have these supplies at my fingertips, yet out of sight, and gathered in one container which would be easy to pick up and move outdoors on a fine day. The pannier also takes advantage of dead space on the chair. As I planned two, one for each side of the chair, I decided to roughly divide things by which hand usually holds the object. Pencils, pens, scissors, glue stick and Rapesco clip tool go on the right side, as well as some frequently used paper articles like small sticky notes and flags, small sized blank paper and a few other bits and bobs. The left pannier will hold larger paper, lists, set square, ruler, calculator and some empty pockets for waste paper and any additional item I may use occasionally. The pannier is made of cardboard with box-pockets glued to the front, made to fit specific items. I first made a list of all the items I wanted to include, cut out a rough outline in paper in 1/2 scale and moved these paper models around until I was happy with the layout. For the pannier I chose a size slightly larger than A4 so they could hold any file with project material I am working on as well as blank A4 paper (planned for the left side panel). I also had a couple of little plastic flag holders which I attached with double-sided tape. These also hold my slips for tasks. At the back of the pannier I attached some Velcro (hook side), and sewed Velcro loop tape to each chair. I also stitched some fabric tape to the back at the top to use as carrying handle. The down-side of a chair pannier is that it wants to swing inwards, and has to be supported in some way at the lower edge. With two panniers a spreader bar at the bottom would keep them hanging straight, but as I have only made one pannier so far, I had to attach a shorter bar to the chair post to push the bottom of the pannier out. The bar is a twig with the thin end looped around the post, and the other end has a small nail sticking out which goes through a punched hole in the lower edge. This is a rather primitive set-up, but it works. The current version is a prototype. A few minor flaws are showing up in use. The problem of the pannier leaning inward was the first I discovered, and had to rectify. The card could have been a bit thicker and the Velcro strips a bit bigger. The pannier rattles a bit when the chair is moved quickly, but is not too	irritating. It would be nicer in fabric, but cardboard is probably better suited to the job, as objects don't snag on the material. An upgrade would probably be thicker card with some nice marbled paper cover. 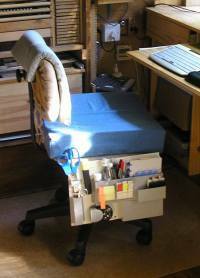 A wider base would allow it to stand on a table or the ground, so it could be used where I don't have a chair with Velcro docking attached. In conclusion I consider it a success, but one which could be tweaked a little.